What a powerful arrival today, at our last major town before Gladstone. Capricorn Conservation Council and other activists in Rockhampton welcomed us with music and information in the beautiful Kershaw Gardens. 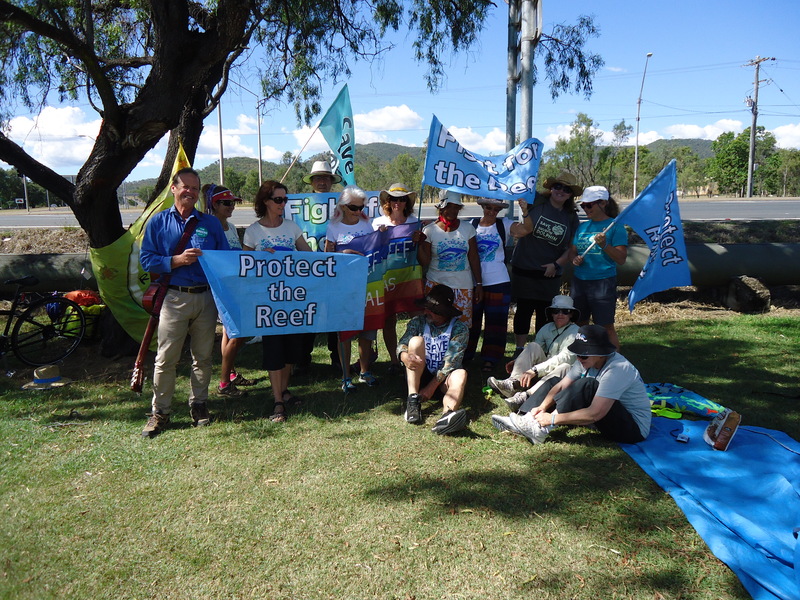 They have talented and experienced staff with high hopes to protect the Fitzroy Delta from coal port developments. The unique snubfin dolphin lives in this area and is threatened by the proposals to send coal on barges through the reef. A great segment on 7WIN TV newshour reflected our efforts and good work from the local group to ensure media were briefed before we came. As usual, great work. We just don’t have enough people like you lot to try to tell the general public what’s going on. We’re still too much of a ‘she’ll be right mate”. Keep it up and we’ll do our best at C4 as well. Frustrating at times, but when you talk to someone really interested, it makes it all worth while. You are truly amazing. Two months down and one week to go. Thank you for your passion and commitment.